There is a lot of confusion going around today. There is a lot of wrong doctrine being spread. In order to stay in the no spin zone, let’s read what the apostle Paul tells his son in the faith, Timothy. In view of his appearing and his kingdom, I give you this charge: Preach the word; be prepared in season and out of season; correct, rebuke and encourage—with great patience and careful instruction. For the time will come when people will not put up with sound doctrine. Instead, to suit their own desires, they will gather around them a great number of teachers to say what their itching ears want to hear. They will turn their ears away from the truth and turn aside to myths. But you, keep your head in all situations, endure hardship, do the work of an evangelist, discharge all the duties of your ministry (2 Timothy 4:1b-5, NIV). This was prophetic insight into the future. This was a foreshadowing of the people’s hearts in that day, which I believe is that day–would directly affect the temperature in which the word of God is preached. I say if you have itchy ears get a Q-tip. We are supposed to affect the culture. The culture is not supposed to affect the church. Now, because we live in a day and age of political correctness it has trickled down into the church. The church has become Biblically incorrect. In order to make God more attractive–I don’t believe it’s a purposeful thing–God is presented as the happiness guru. He’s our genie in a bottle. He’s come to make all our dreams come true. 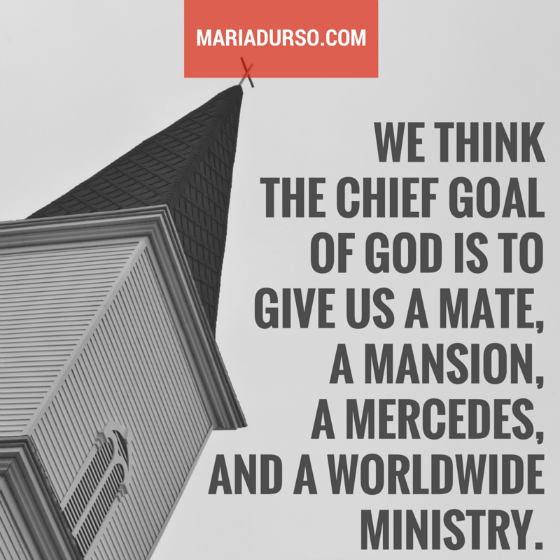 We think the chief goal of God is to give us a mate, a mansion, a Mercedes, and a worldwide ministry. But I found a Scripture that cuts to the chase and explains exactly what the chief goal of God is, and why we are saved. And we know that in all things God works for the good of those who love him, who have been called according to his purpose. For those God foreknew he also predestined to be conformed to the image of his Son,that he might be the firstborn among many brothers and sisters (Romans 8:29, NIV). We are called according to His purposes. God knew us before we were born, and we are conformed us into His image. He foreknew each and every one of us. He has a purpose and a plan for each and every one of us. He predestined us. This is where we get the word destiny from. Question: What do you think the chief goal of God is, and how does it affect the way you life your life? « What is Revolutionary Thinking?